There are many major efforts. And the smaller ones add the sparkle. 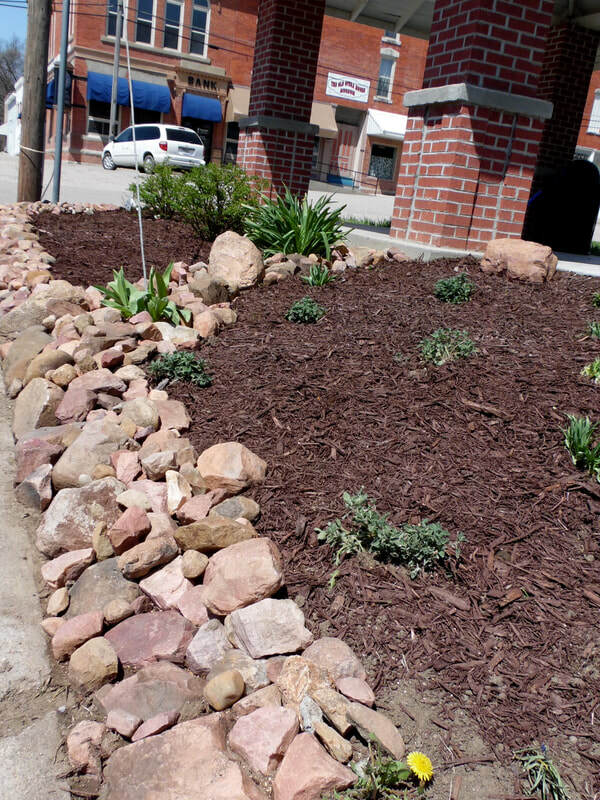 Table Rock is getting another pretty place. The Park Board asked Valerie Binder to come up with a design for landscaping on the south side of the water fountain pagoda. She did. Then she gathered family to do the work. Valerie and her mom, Jan Buchholz, planted flowers in front of the picnic table that sits on the east side of the pagoda. 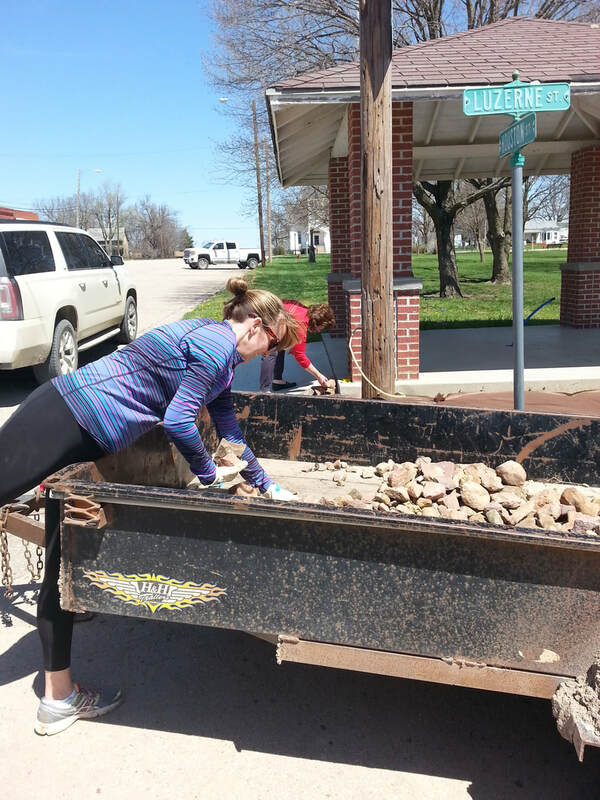 Then Valerie with her daughter Sydney and son Lance gathered and loaded rock donated by cousins Craig and Crystal Binder. “How much rock do we need?” Lance asked her. “Let’s load rock into the trailer for 45 minutes,” she said. Valerie’s husband Tyler and their son Ryan then hauled the trailer of 45-minutes-worth of rock to town. Valerie and Elaine Binder, her mother-in-law, were busily unloading and placing the rock when I arrived. 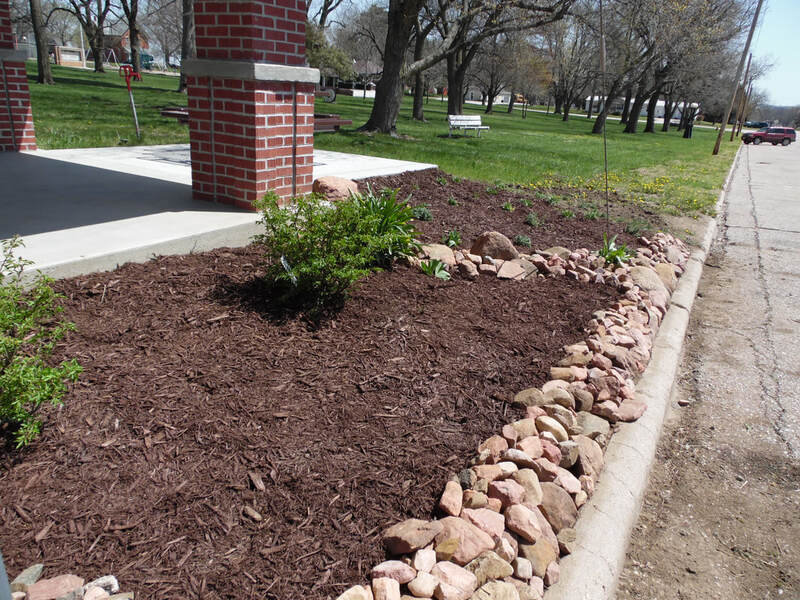 The next day I stopped by and Valerie was patting the last piece of mulch into place. It looks great, doesn’t it?! Now starts the next phase of elbow grease – keeping the plants watered this summer. The ones Valerie chose are hardy, and should do well with minimal care, but they will need watering this year to get established. Thanks to all of the Binder family for spiffying up this little corner and to Valerie for her plans for more work for herself by keeping that garden watered. That corner is the most noticed of the whole Square. 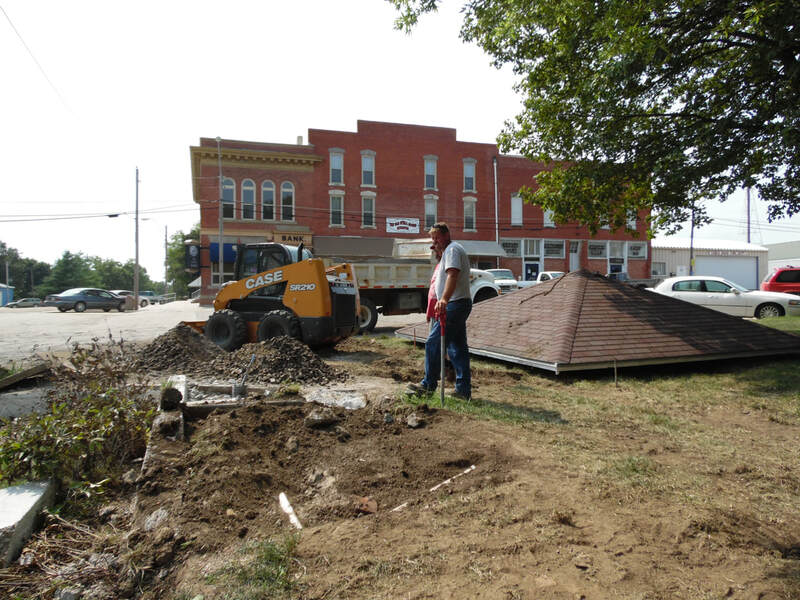 The pagoda is anchored on its three corners by the State Bank of Table Rock, the old Odd Fellows Building, and the Argus Museum & Picture Gallery. By the way the Park Board for the Village consists of Amy Hunzeker, Kelly Vogt, and Jennifer Newman. 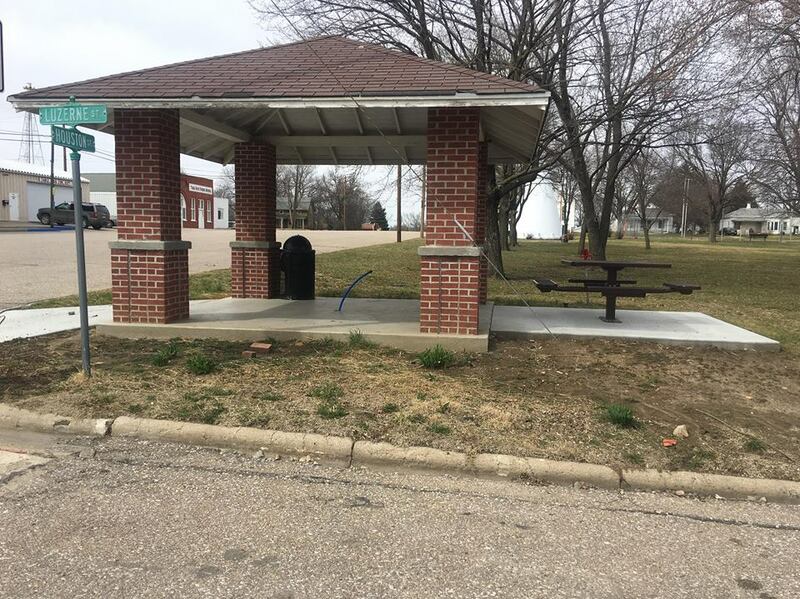 And that picnic table now on the east side of the pagoda was donated by the Vondrasek children – Linda, Cheryl, Bobette, and Roger, in memory of their father, Bob. The exterior of the Saddle Rock (below left in 2012) has not changed much, but the new sign over the door that marks the Round Up, "Cold Beer - Good Service" marks the way into a whole new world. Among other things, new owner Judy Stockholm saved the old bar back, which had been sold off and stored by the new owner in a barn. Her family restored it and it now stands at the heart of her new space. A member of the Community Club's Fair Committee called Richard Sitzman. There were a lot old cast iron and wood picnic benches in the basement of the bandstand. Could anything be done about them? Later that day, a trailer load of sad benches made its way to Lower Town. Richard rolled up his sleeves and also put some of his men from Sitzman Repair to work. By fair time, damaged was replaced, they were sandblasted, and had a beautiful coat of white paint. A trailer load of sparkling happy benches made its way up town to the Square. Out they went in front of the bandstand. On fair day, people brought their camp chairs, but many chose to sit on those new old benches to enjoy the polka music of the Greg Blecha Trio. The good old pagoda looked so grand that the Table Rock Community Club added bunting for the fair. Now it looks even grander. Here is it on Living History Day 2017, the day before the fair as a background to a story-telling station. When it was built in April 1924, the pagoda was lovely, as seen here in about 1927, when the Square was lovingly cared for by an old Indian fighter by the name of Hayek. The pagoda replaced a windmill that stood there to provide water from the town's well. When a water works, with a water tower at its core, was built, the well was abandoned and the pagoda built with a water fountain within. In those days before bottled water, many a rural family in town for shopping on a hot day welcomed the water, as did kids playing in the park in later years. By 2015, the pagoda was in sorry shape. The floor had tilted significantly, with the south side (in the picture above) left higher than the north. The structure was still solid but on its way to eventual collapse. People wrung their hands and bewailed the fate of the much-loved old thing but nothing happened until the Historical Society stepped up and offered the first $10,000 for the cost of rebuilding it. Ultimately, it was determined that the hollow brick columns could not be saved. The roof was in fine shape, though. 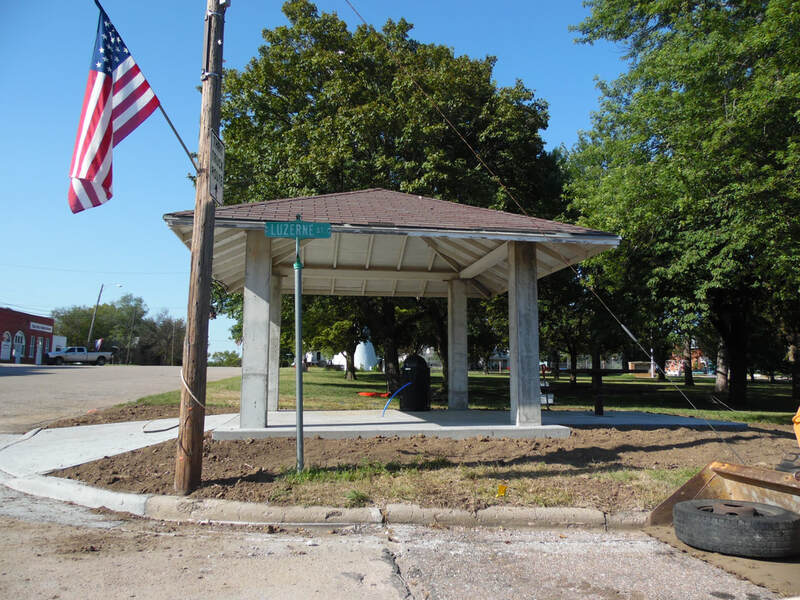 Ultimately, the roof was removed and set aside, a new concrete floor and concrete supporting columns were poured by Mezger Construction, the columns were faced by bricklayer Brandon Schwang, and the pagoda was ready for the 2017 fair. And yes, there will be a fountain. 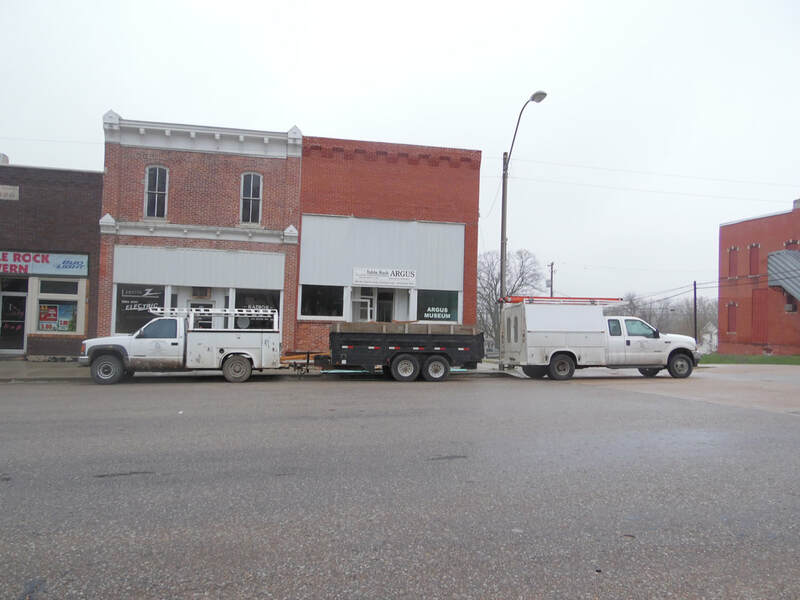 The Historical Society has purchased one and hopes to install it well before the 2018 fair. By the way, the total cost of rebuilding the pagoda was about $13,000 - $14,000. Mezger Construction takes the hat off and sets it aside. Floor and supporting columns of poured concrete. 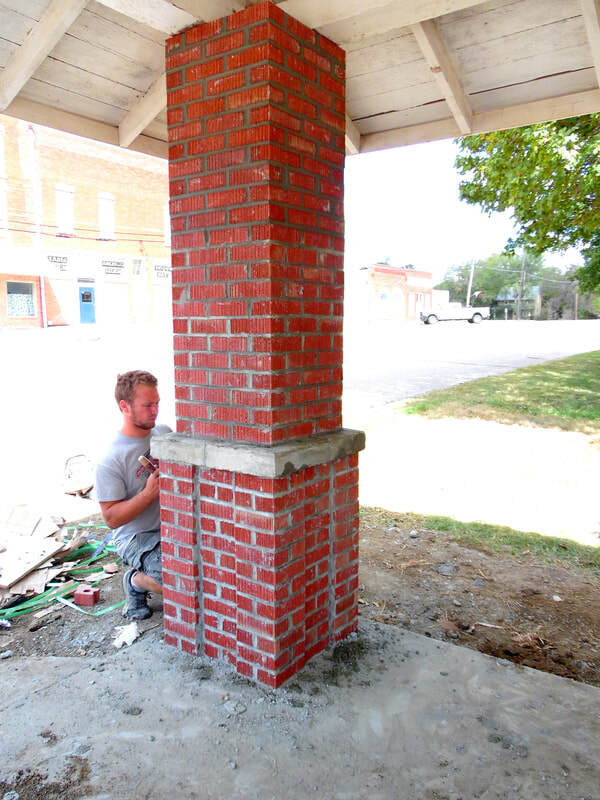 Bricklayer Brandon Schwang at work. Water fountain pagoda redux. At the far corner of the park can be seen the house built by Chauncey & Fannie Norris circa 1875-1880. The building was constructed in 1894 by William L. Lindsay as the site for his new general store. 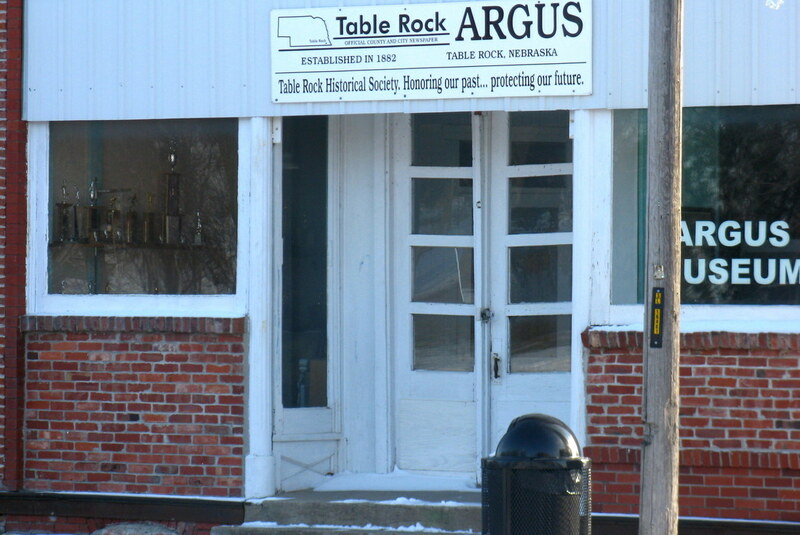 The ground floor of the building was later used as a grocery store, a pool hall, an ice cream store, a cafe, and, finally, was the home of the Table Rock Argus, a country weekly in operation from 1882 to 1974. When editor Rudy Senft died in 1974, the building was donated to the Historial Society and two years later the Argus Museum opened. By 2014, it was very tired. It needed a new roof, it wanted some updating, and it wished it could go to the ball. With money given by the Herman Bachenberg Trust, the Historical Society undertook major renovation work inside, removing interior walls that had once been built in to house a barber shop then a beauty parlor, and removing a false ceiling put in even before that, and doing much much more. With the generosity of the late Verlin Beethe, the aged roof was also treated to an updo, with a metal roof built up over the old tarred surface. 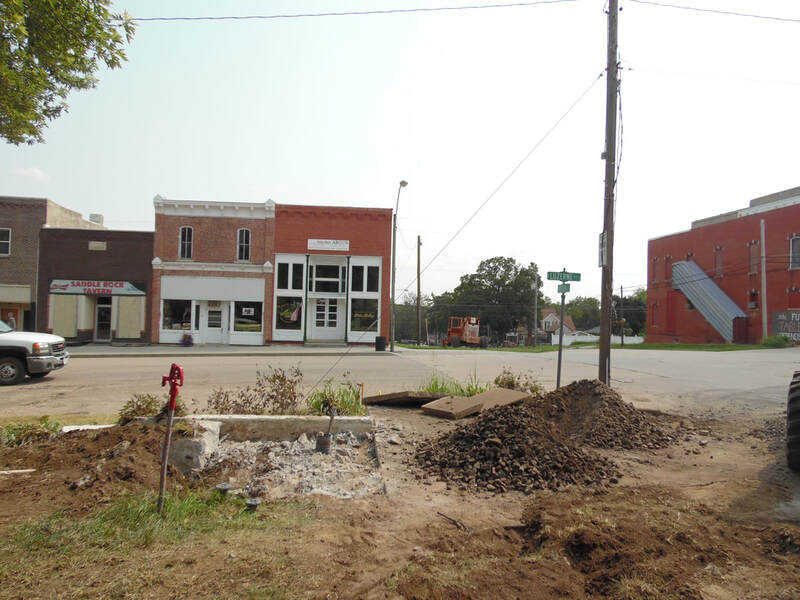 This corner of the most visually important intersection of the village was radically improved. Kim Vrtiska and Sharla Sitzman were co-project managers, Rich Mezger was the contractor, and many were the volunteers who took down the many old pictures that had been displayed and moved them to safety, moved heavy stone-topped tables on and off the floor before and after renovation, painted walls, and more.